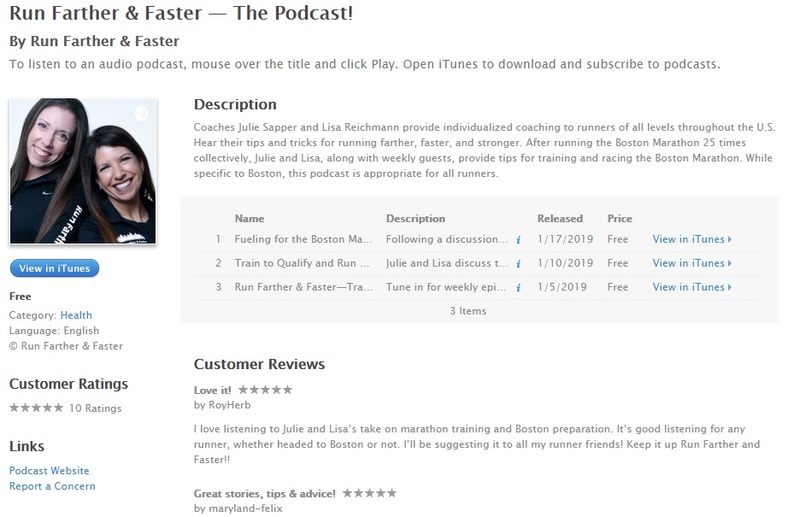 Download the Run Farther & Faster Podcast! As we approach our collective 27th Boston Marathon on Monday, April 15th, we are publishing a weekly podcast tracking our preparation, covering subjects from training runs to weather to nutrition to injury prevention. Even if you are not training for Boston, our topics and special guests provide helpful information applicable to any training and to life in general! Join us on our 13-week journey towards the start line in Hopkinton on Patriot’s Day! Download and listen now on itunes or Stitcher. Click here for videos of strength training exercises discussed in Episode 5 with Eric and Christy Giroux of Prime Fitness.